A man who was sentenced to three years in prison for his role in kidnapping a lesbian’s daughter said that he’s only in prison because he’s a “political enemy” of Barack Obama. 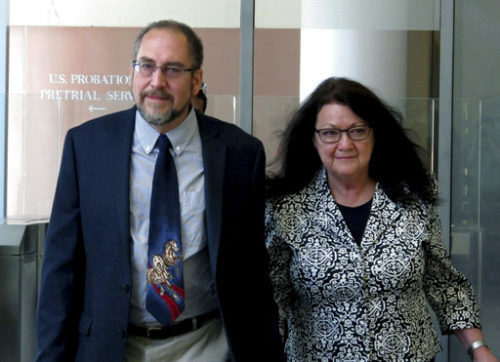 Philip Zodhiates was convicted in federal court last year of helping Lisa Miller take her and her ex-partner Janet Jenkins’s daughter, Isabella, to Nicaragua in 2009, a month after a court awarded custody of Isabella to Jenkins. Bryan Fischer, formerly of the American Family Association, an SPLC designated hate group, had Zodhiates on his radio show, Focal Point. And he wasted no time getting into a conspiracy theory to explain the prosecution. “It was definitely collusion between the White House, the Department of Justice, and the pro-homosexual radical groups,” he said, adding that he was a “victim” of Obama’s attempt to silence critics, not someone who got caught kidnapping a child. Fischer asked Zodhiates if he sought help from “religious liberty” organizations, even though his case did not involve a religious freedom argument. There is no First Amendment right to kidnap seven-year-olds, even if your religion tells you to. What Fischer betrayed with that question is that even he sees “religious liberty” as a euphemism for taking away LGBTQ people’s rights. Zodhiates responded that none of them would take up his case because it was criminal, not civil. Miller and Jenkins had a civil union in Vermont, and in 2002 Miller gave birth to their daughter Isabella. They separated in 2003 after Miller became an evangelical Christian and said that she had become straight. She denied visitation to Jenkins and claimed that she wasn’t Isabella’s mother and spent years fighting a legal campaign to end Jenkins’s parental rights. In 2009, the court in Vermont had had enough of Miller’s refusal to grant visitation and turned custody of Isabella over to Jenkins. But Miller and the seven-year-old didn’t show up to give Isabella to Jenkins at the court-ordered time, and it was found out later that Miller had taken Isabella to live with a Mennonite community in Nicaragua. Last year, federal prosecutors accused Zodhiates of driving Jenkins over the border to Canada and helping her take Isabella to Nicaragua. He was found guilty of international parental kidnapping and conspiracy, and he got three years in prison. Zodhiates claimed at his trial that he didn’t know what Jenkins was up to, but his story has apparently changed now that he has been found guilty and his prison sentence is starting. Neither Miller nor Isabella, who is now 15, have returned to the United States. Two other men were arrested and convicted on international kidnapping charges. Miller is considered a fugitive.